The VWR 1175PD Recirculating Chiller offers reliable, temperature-controlled chilling that helps reduce operation costs and build up. This circulator is powered by a positive displacement pump with a maximum adjustable pressure of 100 psi. Positive displacement pumps may have less flow than their magnetic centrifuge pump counter parts, however this allows users a higher pressure for more demanding applications. Using a recirculating chiller instead of a tap water solution helps to cut down on water consumption, and maintenance of scale buildup, while providing reliable cooling for applications such as laser etching, reaction vessels, plasma etching, AA furnaces, ICP, rotary evaporators, condensers, and vacuum systems. 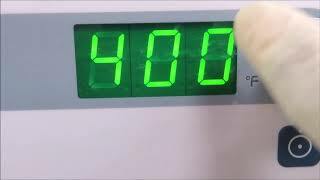 The digital control of the VWR recirculator lets end users set their desired temperature, monitor those temperatures on the display, and check the pressure/ flow rate all with the touch of a button and a turn of the dial. This 1.1-gal chiller has a temperature range of between -10 to 40°C / -4 to 104°F and features a 1/2 horsepower compressor. The VWR 1175PD benchtop chiller has a flow rate of up to 3.75 lpm/ 1gpm. This VWR 1175PD Recirculating Chiller has been fully inspected and is performing without issue. All of our lab equipment comes backed with our standard warranty. Should you have any questions, please don't hesitate to contact us.